Imagine having a shade arbor with edible fruit in your backyard. When you plant grape vines at the corners of an arbor and train them up the support poles, in several months they will produce long vines that will burst with grapes by fall. Many varieties of grapes work well on an arbor. You can mix varieties that suit your preferences and give you juice, jam, snacks or even wine. Your grape arbor can be large or small. The smaller it is, more of the grape vines will cover the top to create shade. Because most varieties of grapes produce vines, or canes, that grow 15 to 20 feet each year, calculate how much of your sturdy wooden arbor four vines will cover. Corner poles are typically 8 feet high. When you plant one vine at each corner, it must grow that length to reach the top. When your grape vines stretch across the top of the arbor, each corner vine will extend approximately 7 or 8 feet (or a little more) into the center of the arbor. If your arbor is 15 or 20 feet long, your four grape vines will grow up the support poles and then meet in the center and provide full shade by midsummer. If you want a larger arbor, you’ll need to install additional support poles, which are perfect places to plant additional grape vines. Choose grape vines that are well suited to your part of the country. Also consider how you plan to use your grapes--will you be making juice? Concord grapes are good for that. Jam or jelly? Concords and even some wine grapes such as cabernet make the best jam. If you want grapes for a healthy snack, choose Thompson seedless or red flame seedless. Wine grapes include chardonnay, merlot, cabernet sauvignon, chenin blanc and many others--choose types that produce long vines instead of grapes such as French colombard that perform best on an espalier, which is a support only several feet high that allows the vines to travel on wires parallel to the ground. If you plant several different types of grapes at the corners of your arbor, the different colored fruit will look attractive when it hangs down when ripe, according to Oregon State University. Purchase bare root vines of the variety or varieties you like. Dig a planting hole twice as large as the root ball at the base of each arbor support pole. Mix any type of slightly acidic compost with the soil you dug out and then backfill about halfway. Set one vine into each hole, refill with the leftover soil/compost mixture, and then pat the soil down around the grape vine’s trunk. Keep your grape vines well watered but never allow the soil to remain soggy. If you flood the area around the base of your vines once each week when rains do not occur, this is the correct amount of moisture. Fertilize your vines with 10 oz. 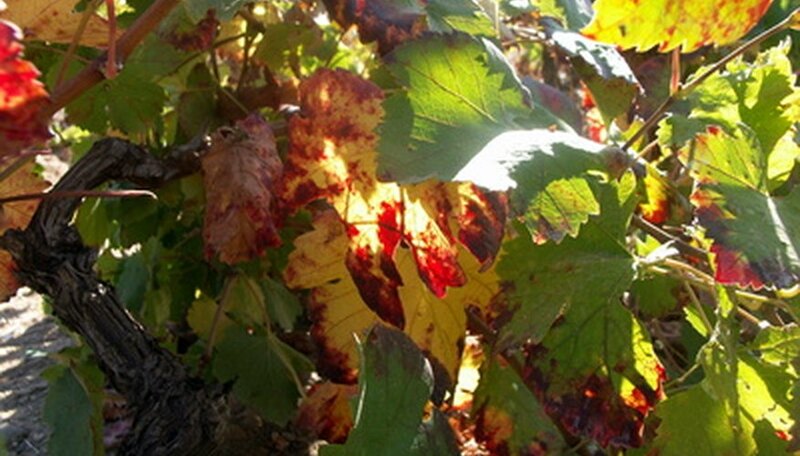 of a 10-20-20 plant food once each spring, before the vines begin to send out vigorous growth. After your vines have covered your arbor and produced fruit in late summer or fall, it helps next year’s crop if you prune your grape vines correctly. Allow long canes to continue covering your arbor, which will include more “buds” on each cane--this method of growing grape vines will result in slightly less fruit quality but will accomplish the goal of shading the area under your arbor. Always prune off small lateral canes and those that appear dead, diseased or broken. Because grape vines grow so long each year, you can prune your vines down to the main trunk, which is standard. You won’t have shade during the winter, but that can be a good thing if you enjoy outdoor living year-round--sitting under your arbor on a sunny winter day will be warmer than if you allowed your vines to cover the arbor.